I don’t think I’ve ever had as much fun with letter crafts as I have this year. The kids really connect with each letter and enjoy putting together a craft that goes with the weekly theme. 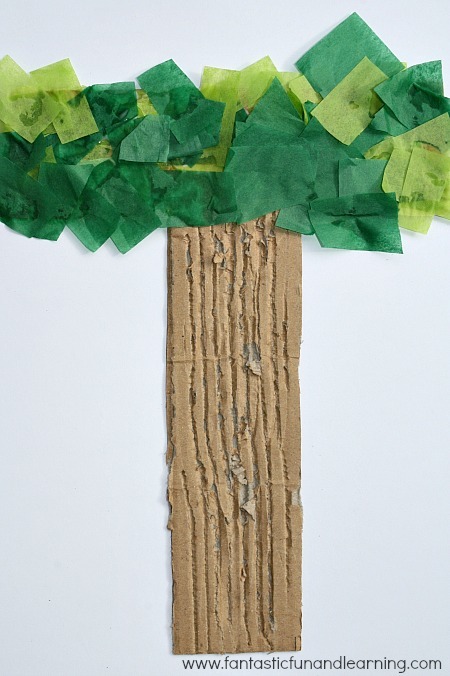 This week’s T is for Trees craft was inspired by the Letter T Craft from Counting Coconuts. We started by grabbing some cardboard from the recycling bin. Thick cardboard that has ridges (is there a name for that? ), not flat cardboard like you would have on a cereal box, will work best for this craft. I cut the cardboard into the T shape. Then the kids and I talked about the bark on the trees we had been observing throughout the week, and we discussed that most trees have ridges on their trunks. We used a fork to create ridges on our tree trunks. The kids spent some time dragging the fork down the cardboard and experimenting with pushing softer and harder to make different imprints. When they were happy with the look of their bark we moved on to the next step. We added tissue paper leaves in two shades of green. Then we proudly added their finished crafts to our alphabet display to use as we review letters and sounds. This is going to be the last post in our T is for Trees series for now. We did do some other crafts and a lot of exploring in the woods to learn about trees first-hand, but they are very similar to the activities I shared in the first post of this series. I’m sure we’ll be exploring trees more in the future, and I’ll include those posts in the series as we do. For now you can find more ideas for learning about trees on my Letter T Pinterest Board. If you have other kid-friendly craft tutorials, we’d love for you to submit them. If you would like to display a featured button on your site, you can get one from the right side bar of your post above. Thanks for a great project idea! I’m doing a link-up today of Letter T related posts and this would be perfect if you’d like to link up! 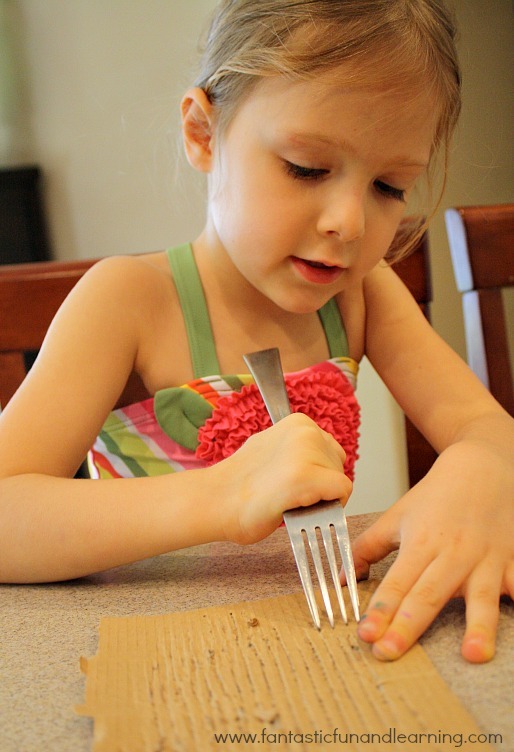 You know I love all your letter activities but this one might be my favorite because I know my son would really have fun using a fork to create ridges. Great idea! I know exactly what you mean, Ann! That was definitely the highlight of this letter craft. They loved used the fork and experimenting with the different markings they could make.